School of Pharmacy at the University of Waterloo, designed by Hariri Pontarini Architects, offers the city of Kitchener a new landmark. A public and private partnership between the city of Kitchener and University of Waterloo created a rare opportunity to provide the citizens of the region with a facility that offers a superior education with pharmaceutical services, while energizing the urban landscape. The resulting school-clinic hybrid sets an important precedent for future academic developments, highlighting the importance of combining education with real world practice. The project incorporates a rich program, mixing faculty and student laboratories, lecture and seminar rooms, an auditorium, a herbarium, and a commercial pharmacy. An integrated primary healthcare centre is a core aspect of the educational program, providing full service medical care and a learning venue for students, medical residents and health care professionals. The building encourages collaboration and dynamic interaction between students and faculty. An enclosed courtyard and large central fireplace create interactive gathering spaces which foster discussion and the exchange of ideas. A herbarium moves outside the confines of traditional pharmaceutical practice, encouraging a broader, more holistic approach to the field. Here, the school will also offer scientific and public lectures on the plant-based origins of modern medicines. 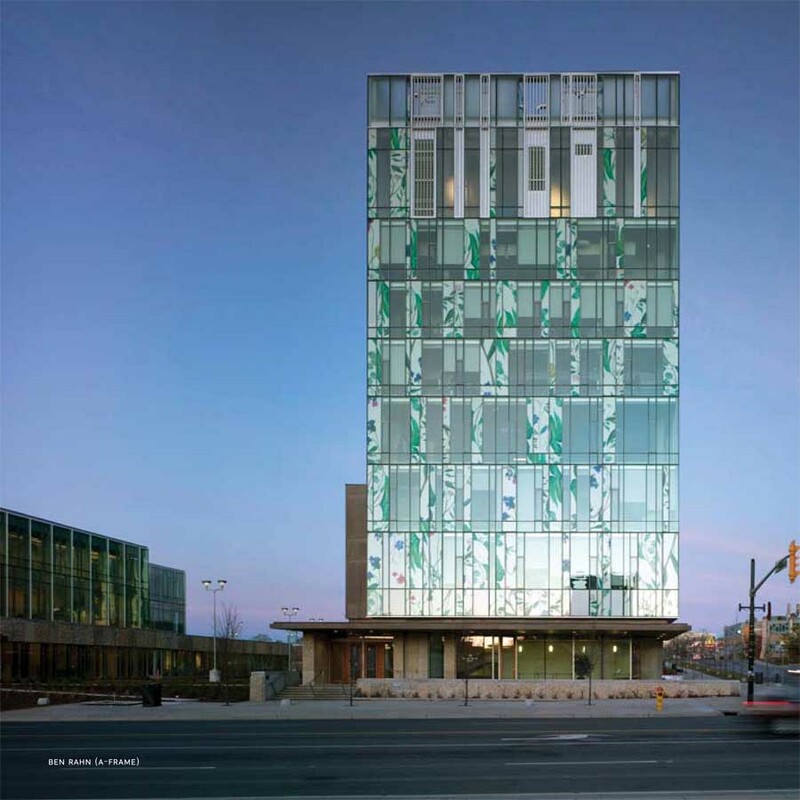 The innovative exterior glass panels, laminated with custom-designed herbal patterning, convey imagery of the early stages of medicinal use, showcasing traditional plant varieties while simultaneously enhancing the streetscape with an unprecedented aesthetic for this increasingly urbane neighbourhood. It also serves to reduce light penetration and thus, efficiently control heating and cooling loads. The use of local materiality serves to further this holistic effect: recycled wood flooring, Algonquin limestone, and copper detailing create a fresh interpretation of the traditional canon of academic institutions. 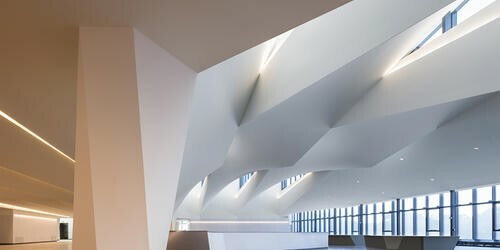 The building’s key programmatic features include: an eight-storey tower directly on the corner of King and Victoria Streets, creating a strong gateway to the downtown; a central outdoor courtyard providing a venue for both interaction and quiet contemplation and the opportunity to host art exhibitions and outdoor performance. The architecture and facilities provide a wealth of benefits to the school’s users and to the wider community at large. 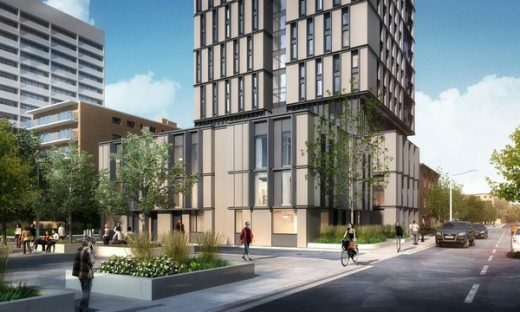 Sited outside the main campus in downtown Kitchener’s warehouse district, the new building for University of Waterloo’s School of Pharmacy assisted with the rejuvenation of the downtown core with the inclusion of students, faculty and community. To facilitate the use of the most progressive teaching and learning methods, the School of Pharmacy is designed with an array of classroom and laboratories, suiting a range of different group sizes including tiered lecture halls, seminar or classroom-style lecture rooms, and flexible labs. The building responds appropriately to the active urban surroundings through its illustrated glass skin, ground floor café and curved north façade. Sustainable features were implemented to solve urban construction issues that were imposed on the designated site.